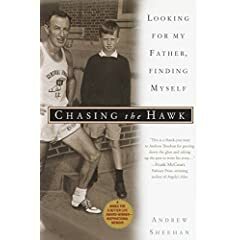 The author of this book, Chasing the Hawk: Looking for My Father, Finding Myself, is Dr. Sheehan’s son, Andrew Sheehan, a self-described alcoholic and drug abuser. This book is more than just a chronicle of growing up in large family in the shadow of a famous father. This is the story of a struggling son and a struggling father working together (sometimes voluntarily, sometimes not) to find peace not only with each other, but with themselves as well. After a lifetime of anger, denial, and feelings of abandonment, a father’s love and a son’s admiration comes through. Along with being a solid book on recovery, forgiveness, family, and faith, it also gives a backdoor view into the world of Dr. Sheehan and his family. It shows him, not as an infallible doctor, guiding the masses to fitness, but rather as a faulted, vulnerable human being. The author works hard to ensure that the many facets of Dr. Sheehan’s personality are shown and the reader gets a full impression of what Dr. Sheehan was about—warts and all. If you are looking for a running-related book that is about more than VO2 max or heart rate training, this is the book for you. It covers enough running specific information to stay interesting to the avid runner, but also makes great strides in personalizing an icon and delivering a message of love, forgiveness, and hope. George Sheehan should be mandatory reading for any runner. His advice was invaluable when I first started running and reading Runner’s World. To this day, I read passages from one of his books before I head into a big race. Thanks for bringing this book to our attention. Will be interesting to see a different perspective. Thanks for the review. I read the book earlier this year. I enjoyed it. I’d give it 4 stars too. Andrew’s memoir is an unflinching and compelling look at his Irish-Catholic upbringing and his drifting through adulthood. Throughout the pages and never far from the surface is his father—the man, the myth, the running guru. It’s the story of a son’s relationship with a father who is distant through much of his life. It’s also the story of a dying father reconnecting with his son. The book is well-written. It’s a memoir—so, perhaps, a disclaimer is needed. This is Andrew’s version of the truth. Even so, it paints a picture of his father that is much more complex and interesting than the celebrity running guru persona that I knew. I will be the first to admit that I often go for the sappy and sentimental, but this book had me at the end. wow, i’m going to check this book out now. thanks!